I have a few old standby recipes I’ve perfected over time. 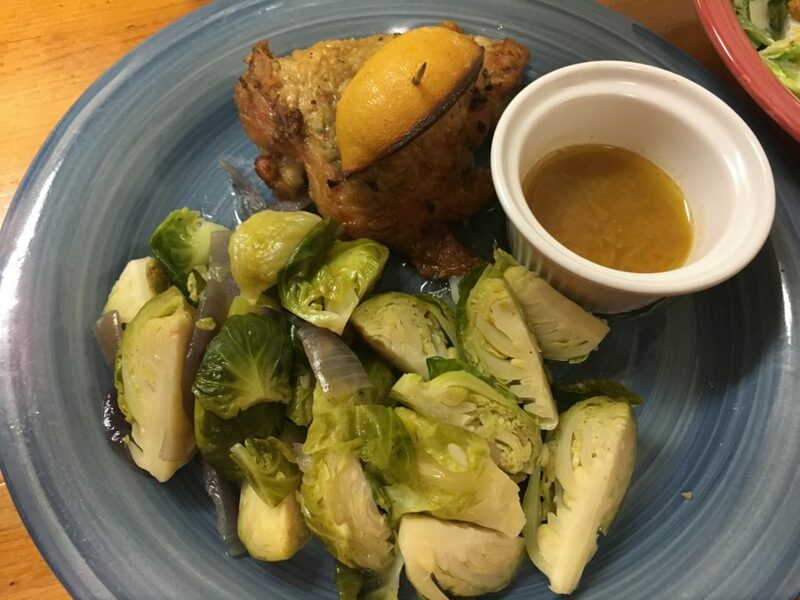 This easy roasted chicken thighs with Brussels sprouts number from Cooking Light is one of them. Usually, I follow a recipe to the letter the first time to see how it runs, and I make notes about what I might change for next time. Nine out of ten times, my adjustments are related to specific quirks of my kitchen, but sometimes, there are flavor needs. This one, however, is so simple and to the point, there’s not much to change. Instead, this will be my “tips and tricks” for getting this tasty crowd pleaser right the first time around. 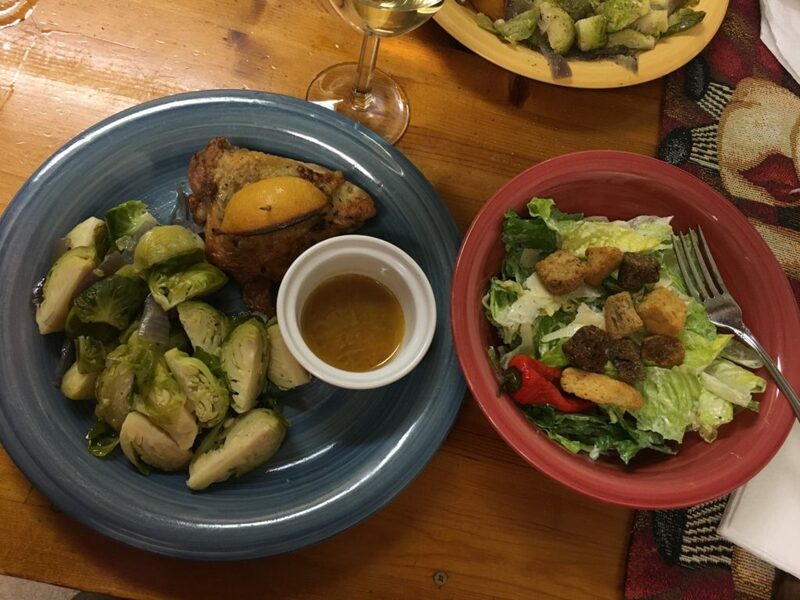 The most recent incarnation of this thighs and Brussels plate. Cut everything up ahead of time so it’s just a matter of moving things around. This may seem simple to a lot of you, but I watch people I know and love chop and dice and run around like beheaded chickens while also trying to watch things as they cook. Because the browning of the chicken takes some attention, I highly recommend cutting it all up ahead of time. It also makes for a nice photo if you prep. Well, it’s a nice photo if you ignore the dish drainer in the background. It’s worth the investment for something like this. I have several pans in several sizes, and if the spirit should move me one day, I’ll buy several more. There’s just a sweet satisfaction in that sear you get on food from cast iron. I don’t care what anyone says about cleaning it. For some people, this is a no brainer. For many of us, though, we hit the grocery store, buy every meat type thing we need, and freeze it until it’s time to use it. I’ve done this both ways, and even with a full thaw, a previously frozen bird makes the first cooking stage more difficult than it needs to be. With frozen thighs, you get skin that sticks to the pan no matter the heat level. You end up then with broken, unbronzed, or burnt skins that you have to hide under lemon slices. 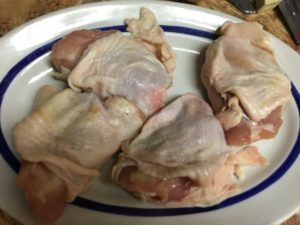 Additionally, the amount of water produced by the previously frozen chicken dilutes the flavor and gives you a cast iron skillet full of oil and water when it’s time to stick it in the oven. That creates a watered down thigh that doesn’t hold up as well. I’m not “that person.” I do try to buy free range or grass fed meat when it’s available and my money is at a sufficient level to make this make sense. However, it’s not become a necessity (or a possibility) yet. With this and other dishes like it (where you brown the chicken), however, I’ve found it to be more amenable to the cooking techniques for a few reasons. The water issue mentioned above is never a problem. The skin separates nicely from the meat without breaking. The pieces cook thoroughly and tenderly without falling apart. You feel socially responsible when you know the chicken had a good life. This is just a handful of options. Check your local stores and add them in the comments. Aside from the shadows there at the bottom, here are the Publix GreenWise chickens in their full, bare glory. Notice the skins are unbroken but separate nicely from the meat. Be patient with the Brussels sprouts. Yeah, this sounds silly, but I’m serious. You’ll want them to brown and crisp a bit before pouring in the broth so they’ll get that coveted crunch. You can see from the photo of the finished product above that I did not do that this time. Let me show you why. I’m 5’2″ (1.57 m) with a size 6.5 (37) shoe. My hands are not “yuge” but proportionate to the rest of me. 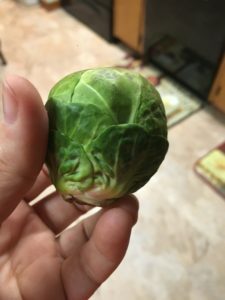 I hope that gives you an idea of the size of this sprout. If the first photo doesn’t give you an idea, I hope this one does. Now. I’m no fool. 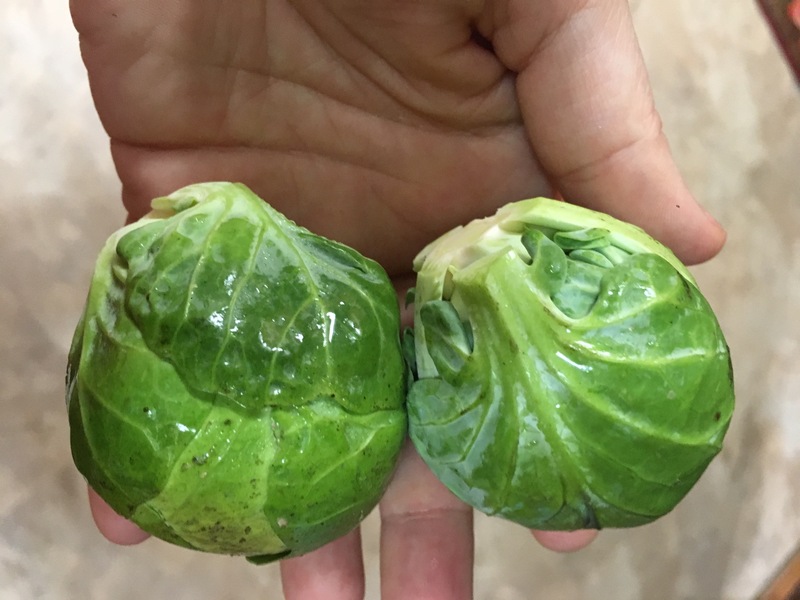 I knew I’d bought very large sprouts, but two things happened. First, I got distracted mid-cooking (thanks, “real” job) and had to tend to something while the chicken was cooking and before I put these on. Secondly, I cut them into fourths because of their size and only realized afterward that I did not have a pan large enough to handle all of them. I ended up essentially stewing them in chicken broth. They were good, still crisp but not raw, but they didn’t get the opportunity to brown like they did here. This was not a romantic date with bad paper towels. It was a normal night at my and my sister’s place. Ideally, you want to heat the pan to a rather hot temp, cook the onions like the recipe says, and then toss the sprouts in to brown and crisp. The broth step should only happen after the browning. 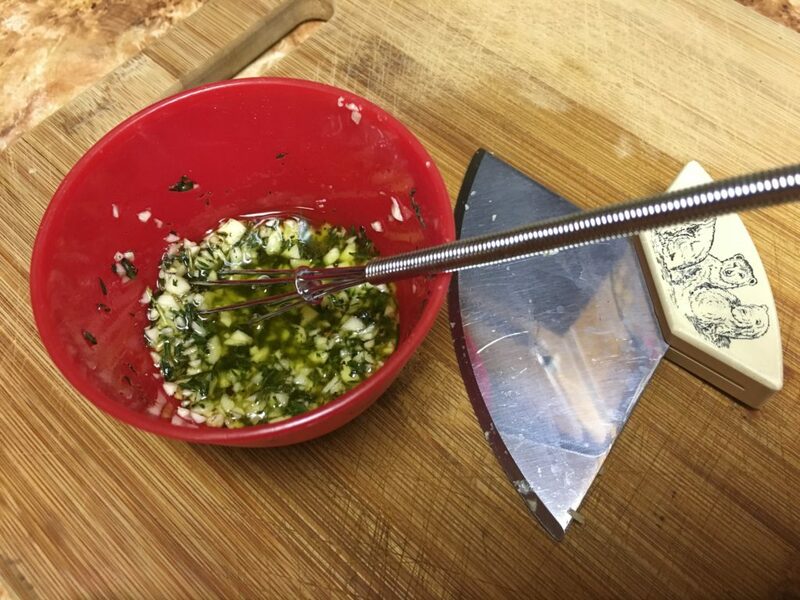 Mix the oil and herbs early. Then let it sit for a while. Let it infuse. This has an awesome flavor even if you don’t do that, but I’ve found the end result is more blended if you do. A glance at the herbs and oil I mixed a little earlier than everything else. The knife on the right is an ulu, and while many people seem to find it pointless, I find it essential for cutting herbs and chopping garlic. Click the photo for a little Wikipedia knowledge in Inuit knife uses. I did once. It did not work. 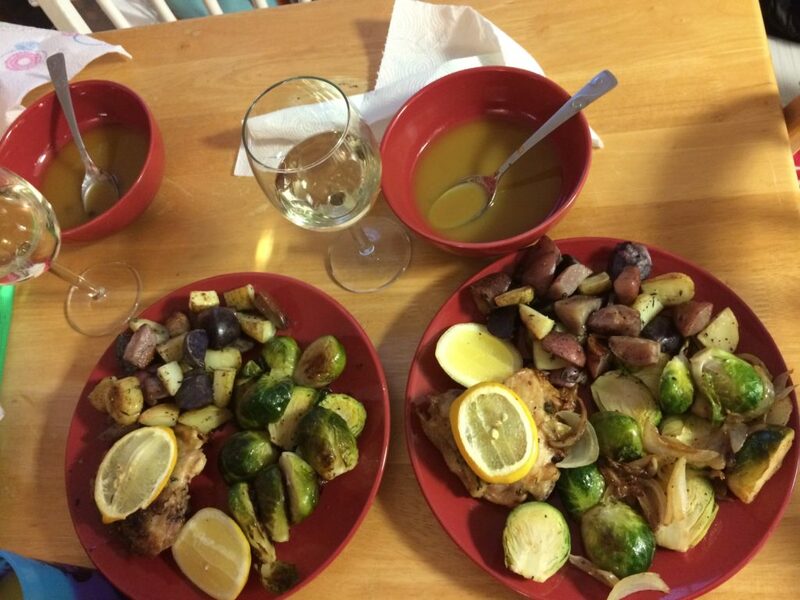 In the second photo of the full meal above, you can see where the lemons are not cooked thoroughly. This was the time I forgot the lemon and ended up throwing it on at the last minute. 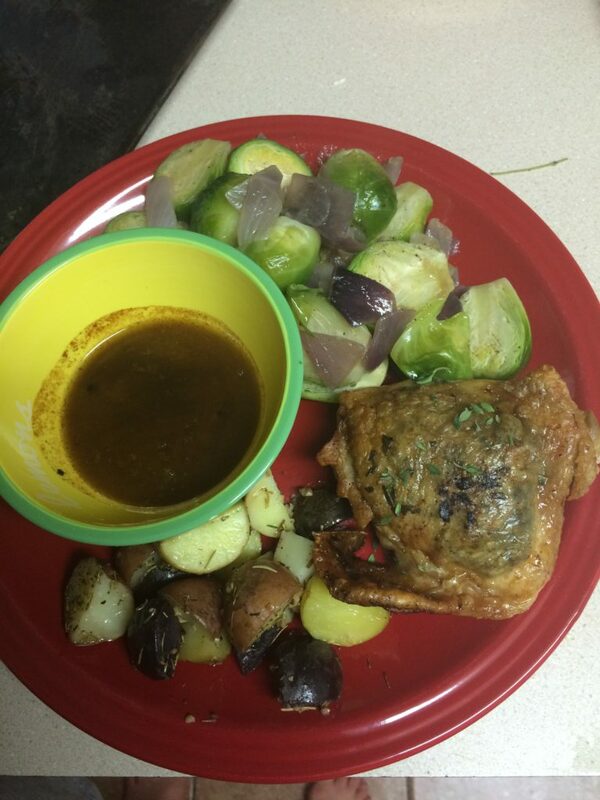 The resultant sauce was good, but it didn’t have the bite it needs to make it amazing. I tried squeezing lemon into the pan with the other sauce components, but it still didn’t work properly. The key really is the cooked lemon, not just the lemon. Also don’t skip the sauce. Yes, skipping a butter sauce means it’s a bit healthier, but this really shines with the lemon butter sauce mixed with the herbs of the chicken. If you don’t use it, it won’t ruin the dish, but it will make it less exciting. Then let me know how it goes. Tell me your best changes…or tell me your worst. I welcome both. Pair it with different sides. Also let me know what you paired it with. If you’re a grain or carb person, there are a number of options. There’s also always room for more veggies, especially some with color. This is the same photo from above, but notice the plate on the left is missing the onions. This is a possible variation if you have an onion-aversion in your home. 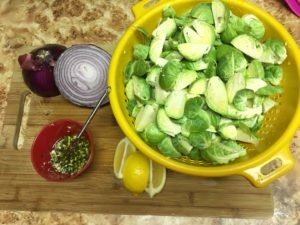 Just skip the onion step and go right to browning the sprouts. Also, look at that sauce. It’s the perfect color and consistency. 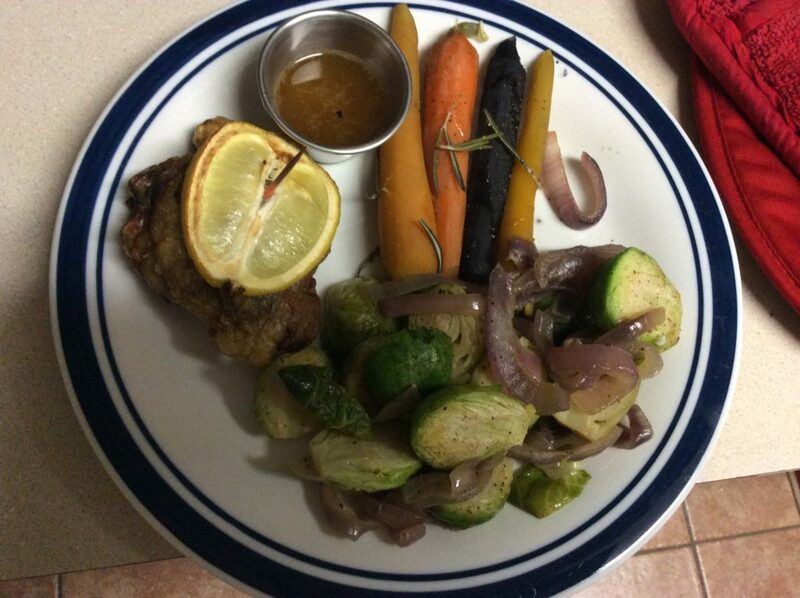 We tried squeezing some lemon onto the Brussels here (hence the fresh cut piece on the plate), too. It was nice, but it’s not necessary. The lemon was removed from this photo because it absolutely disintegrated in the oven and looked really gross (don’t cut it too thin). I served it here with a variety of herbed potatoes (rosemary, sage, and thyme). The sauce turned out a bit browner than I would normally like it to be, but this was a successful run. Here, I went with a variation on the Caesar salad with a roasted red pepper (highly recommended) and Marie’s Asiago Peppercorn (also highly recommended. I’m not a big fan of prepared dressings, but this one is a guilty pleasure. Click the picture for more.) in place of Caesar dressing. 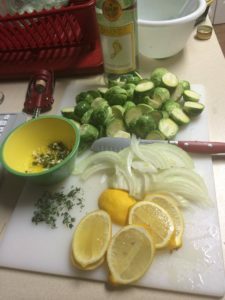 The sauce is a nicer color than the first picture, but the sprouts aren’t browned (this was the Night of the Giant Sprouts). This is a dark photo taken in a rush many moons ago in an apartment long forgotten, but the good thing is you can see the multi-colored rosemary roasted carrots I paired with it, and that’s the whole point here.